The Scottville Harvest Festival and Scottville Summer Fest are blended into one event that will take place the weekend after July 4. 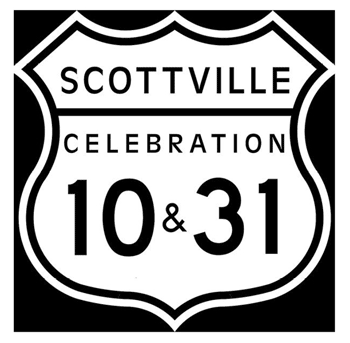 The festival's new name is Scottville 10 + 31 Celebration. In 2019, this new festival takes place Friday, July 12 and Saturday, July 13. Here's what happened in 2018. Details for 2019 will be listed as they become available. Quilt Show, 10am-4pm, Scottville Senior Center. Music at the Shell: MCC Jazz Band, 6:30pm-7:15pm, Clown Band Shell. Miss Mason County Pageant, 7:30pm, Clown Band Shell. Teen Dance, 8:30-10pm, Scottville Optimist Hall. Car Show, 10am-2pm, South Main Street. Craft Show/Farmer's Market, 10am-2pm, North Main Street. 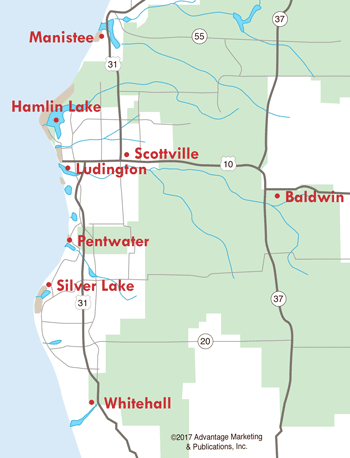 Spartan River Run (canoe/kayak races) 10:30am-1:30pm, Scottville Riverside Park. Kids Games by Mason County Reformed Church, 11am-1pm, Clown Band Shell. Power Wheels Demo Derby, 11am-1pm, North Main Street. Mason County Princess Pageant, 1:30-2:30pm, Clown Band Shell. Rubber Ducky Race, 3pm, Scottville Riverside Park. Summer is in full swing during Scottville 10 + 31 Celebration...don't miss the fun!